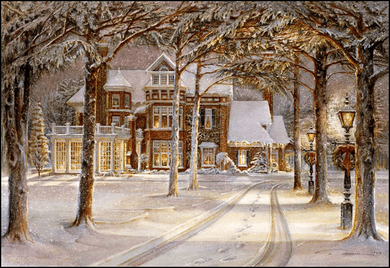 Trisha Romance Handsigned & Numbered Limited Grand Romance Collectors Edition Canvas Giclee: "Silent Night"
Medium: Artist Handsigned Limited Edition Giclee on Canvas to 1,000. About the Artist: "I thank God continually for the simple moments in life...they feed my soul and forever renew my inspirations", says Trisha. Trisha was born in Western New York and moved to Canada in 1969 to attend Sheridan College in Oakville, where she received a degree in design and illustration. 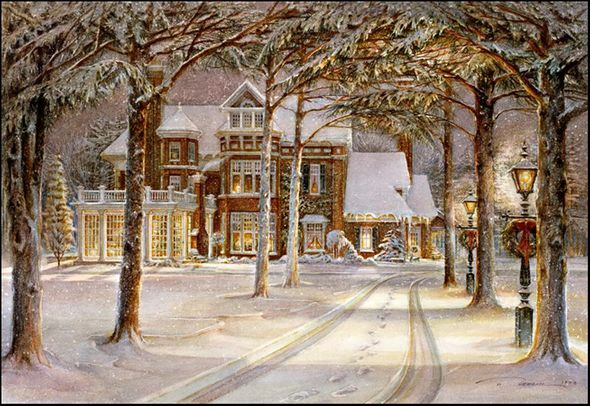 She now lives in Niagara-on-the Lake with her family, who have become the loving focus of her many paintings in watercolour. Since 1980, limited edition reproductions from the originals have allowed collectors to enjoy her artwork worldwide.